Good bread, and I mean the kind that meets the rigorous demands of the title of penultimate comfort food, makes me get into all sorts of trouble. A perfectly crusty on the outside, airy on the inside baguette goes from obsession to nonexistence in a matter of seconds. A poblano cheddar loaf is devoured methodically, each hunk slathered with honey butter to offset the piquant chiles. 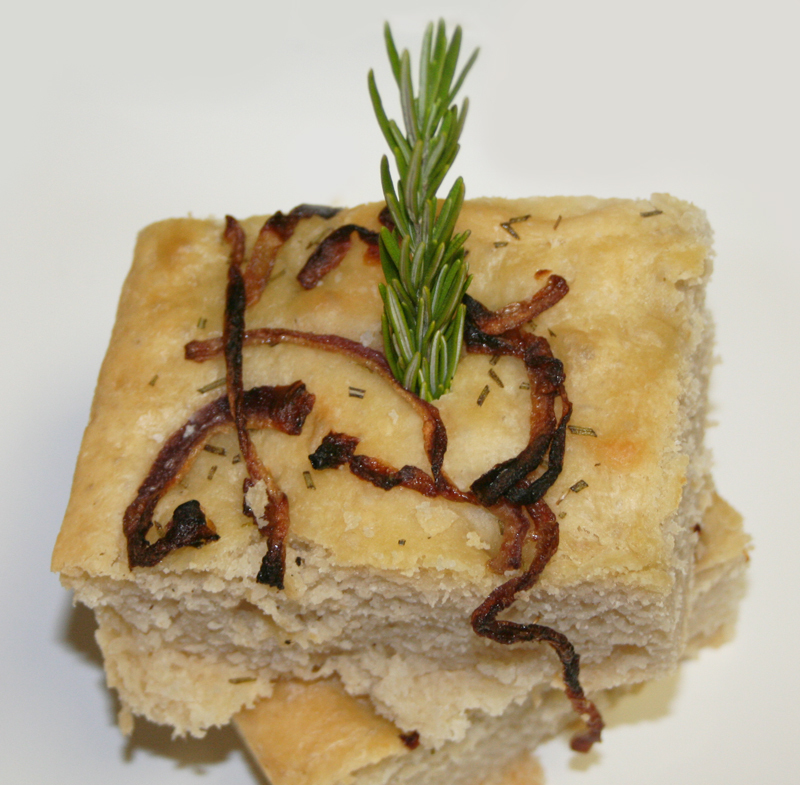 And a fluffy square of toothsome focaccia worth making out with – that, my darlings, is where it’s at. Correction – where I’m at. This recipe was part of the Daring Kitchen for September, a companion piece to made-from-scratch consommé then turned into Devaki Das’ luxe Roasted Apple, Brie and Thyme Soup. It’s an adapted version of David Tanis’ rosemary focaccia, only doubled to give it some height and a little more fluff-to-crust ratio. You let this baby rise over night in a comfy swath of olive oil, turning it out into a baking pan the next day for failproof baking. All this coming from to a girl who sees yeast and flour as the makings of a culinary Amityville Horror. No scares here – this, my friends, is a total love story. In a bowl, mix together 1 c. of the warm water, yeast and 1/2 c. of the flour. Let sit until bubbly and active, about 5-7 minutes. In a standing mixer, add the yeast mixture, the remaining 2 c. of water, 5 cups of flour, salt and olive oil. Let mix until a semi-smooth dough forms – it will be very sticky. Take a spatula and the remaining half cup of flour and scrape down the sides of the bowl, pushing the dough to the center and sprinkling flour on the exposed side. The goal is to gently coat the outside of the dough with the remaining flour. Twirl a few tablespoons of olive oil in a large bowl and pour out the dough into the bowl. Cover with saran wrap, refrigerate and let sit overnight. The next day, heat oven to 400°. Grease a 13×9 inch pan with high sides with a healthy amount of olive oil. Turn the dough out into the pan, cover with saran wrap and leave in a warm place to rise for an hour. While the bread rises, heat a large skillet over medium-low heat. Add the butter and melt, and then add the red onion, salt and sugar. Cook for about 20 minutes, or until onions are extremely soft and begin to caramelize. When it’s finished rising, dimple the focaccia all over with your fingers, sprinkle with the onions, rosemary and a pinch of coarse salt. Bake for 25-30 minutes and then remove from the oven. Let rest for at least 5 minutes, cut into squares, and nosh with reckless abandon. It looks so lovely the crumb is spot-on well done. Cheers from Audax in Sydney Australia. Awww, thanks much! David Tanis gets the credit for the basic recipe – I only elaborated on an already brilliant idea. I can't emphasize enough how remarkably simple this one is.